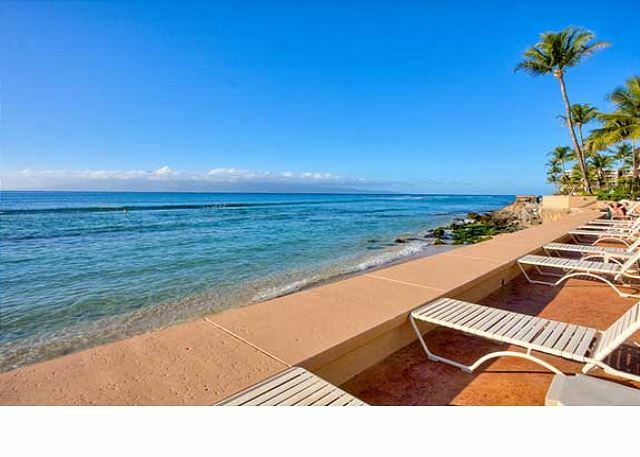 Makani Sands Unit #207 is a beautiful one bedroom condo on the 2nd floor. Easily accessible by stairs or elevator. 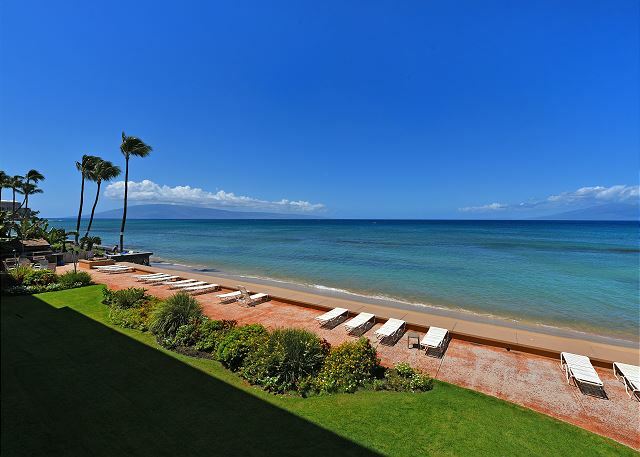 You will be mesmerized by the sound of the waves and the views out to the islands of Lanai and Molokai. The beautiful outside lanai has table and chairs for 4. Perfect for your morning coffee, whale and turtle watching and of course the beautiful Maui Sunsets! This condo has a newly remodeled kitchen, fully stocked with all the modern conveniences (including dishwasher) and utensils to make your stay enjoyable. The newly remodeled bathroom has a walk in shower and new vanity. There is a king size bed in the bedroom and a sofa bed in the living room, giving you room for an extra guest. Large High Def TV's in both the living room and bedroom. Also includes, large ceiling fans, Free WiFi, DVD and Cd players for your enjoyment. This condo has a SAFE for your valuables. Walk to nearby breakfast, lunch and dinner or the world famous Dukes Mai Tai. Makani Sands Unit #207 has been the repeat home to many guests through the years. We hope you enjoy it and make it your home away from home on Maui! For a low energy comfortable holiday on the beach, this is perfect. Staff are so friendly and helpful when you need it. The turtles are there in front every day. And the whales are on display too. Great location, gorgeous views. Saw a sea turtle swim by on our last day, and whale watching from the patio was so nice. Place was clean and stocked essentials. Glad to have the extra fans. Easy in and out. Washer and dryer were small but it was nice to go home with minimal dirty clothes. Little white balls of wood chips in corner of kitchen counter. Showed office, discovered it was termites. Took a few days for cleaners to vacuum debris, including live worms and wings (gross), on counter and alongside stove. Dryer vent had not been emptied in ages. Had to scrape out fluff with knife and power spray wash with kitchen faucet (still not get clean). Tons of fluff behind vent too - needed vacuuming and perhaps could have caused a fire. Never slept in bedroom ... too hot and no air so every night slept on pullout couch. Throw rugs were dirty - needed washing. This place was so accomadating during Hurricane Lane. Our flight plans changed drastically a few times because of the storm, but the Makani Sands really made sure we were taken care of. Excellent place and Awesome stafff!!! Will definitely be back. Beautiful property with gorgeous views!!!! The only bad thing I can say is not being able to access the sand, otherwise our stay was very relaxing! As first time renters at this property, our stay was amazing enough that we plan to return next year, only longer! The only reason there were two four star ratings was because we needed to contact maintenance upon arrival, due to minor plumbing issues. Responsive property management gets A+ and had us operational within a few hours. Otherwise, property maintained impeccably. The view from each of the balconies is unsurpassed. We fell asleep to the sound of waves crashing and woke to see breaching whales over coffee in the morning. The cross ventilation within the condo kept us quite comfortable. Nature's beauty abundant right out your door - I would absolutely recommend ! The condo, grounds and staff were great. Reasonable price. Beautiful sunsets, whales everyday in view from the lanai. Close to shopping and restaurants.The only downsides were lack of beach due to tidal conditions and tiny gnats getting through the screens at night. Probably a seasonal thing. We absolutely loved Makani Sands and will be coming back. The lanai view is amazing. The condo was very clean and comfortable. It had everything we needed to feel at home. Lorne and Marie are two of the hardest working people in Maui. The Monday night pupu party was a lot of fun. We met a lot of other Canadians enjoying the warm weather. This is where we learned about the sunsetting tradition of conch shell horn blowing. It was a blast. The BBQ's were clean every night we used them. I promise you won't be disappointed in Makani Sands #207. Can't wait to return. Thanks again for all your hospitality. We had a fabulous stay at Makani Sands. The location is perfect for a quiet vacation. Stores, larger resorts and beautiful swimming beaches within walking distance. The views from the balcony are stunning and look exactly like the photo. Will definitely return. This location is truly exceptional. Our experience in Unit 207 was a wonderful restful delight. We simply couldn't ask for anything better. Can't wait to come back. Very Enjoyable...great condo unit...nice people. Escaping from the Caribbean hurricane season we booked Makani Sands at the last minute. We couldn't have stumbled upon a better location. Direct oxen views, steps down to the small beach which every day and night produced some magical snorkeling and turtle viewing. The proximity to the local market and coffee shop made this feel a little more local than it did when took the time to visit the bigger resorts to the north and south. This was our 7-8th time on Maui and this was most definitely our favorite location so far. Highly recommended and fantastic value. We will be back again that's for sure. I had a fantastic time at Makani Sands! My room was really nice with everything you could ask for. Very modern like it had just be renovated. Burt and the ladies were super helpful. Don't rent anything until you've asked Burt. He'll have a cousin. You can snorkle, whale watch, and surf without ever leaving the place. I mean, you're right on the ocean in Maui...does this place even need a review? We stayed three nights here and enjoyed it a great deal. First and foremost, the ocean view was a must for us and we had a great one from the balcony. The place is exactly what you see on the pictures. Everything was very clean and organized. Turtles swim by right in front of the building...just amazing! !The place is 5 minutes driving from a great central beach. We have stayed at Makani Sands for many years. This year we were disappointed in the level of furnishings of unit #207. Specifically, The sofa is most uncomfortable and should have been replaced before now. The lanai has cabaret-style small tables and high chairs which are difficult for older persons to use. The kitchen is equipped with a hodge-podge of tableware and silverware; the glassware is a collection of mismatched wine glasses and drinking glasses. We found it necessary to go out and buy matching cocktail glasses. And to make matters worse, while stocking the refrigerator on the first day, a door shelf fell off, causing a quart bottle and two beer bottles to break on the floor (housekeeping had not securely latched the door shelf in place). It would not take a lot of effort to bring this unit up to higher level, but it should be done. Thoroughly enjoyed my two week stay here in February. Enjoyed the waves, especially hearing them at night. The property was well-maintained and the manager couldn't have been more helpful. It was nice to have a sand beach right in front of our place. It was also nice having an elevator. Two suggestions: Replace the hideaway bed mattress. It was not comfortable for two people. And I was charged extra for a third person in a 4 person condo! Loved this Maui paradise. The setting is an easy, relaxing, wonderful experience located right on the water's edge. 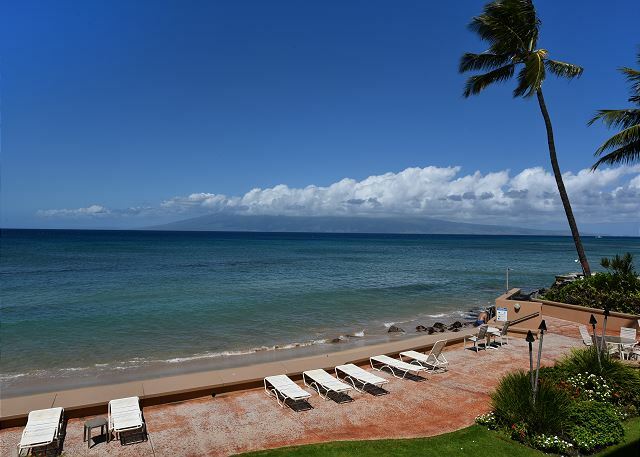 It is a beautiful place that offers a quiet, clean, simple environment, along with serene vistas, waterside enjoyment, beach walks and local amenities -- yet it is only few minutes away from Kaanapali and Lahaina. Can't wait to go back! Mahalo! Happy To Be Back Home Again!!!! I have been coming to Makani Sands since the 1980's -- this is definitely HOME for me! As always, it was delightful to see Roseanna! She is wonderful and it was great catching up with her! I have stayed in unit 207 previously, enjoyed it again! Very pleased with the updates on the property. Happy to meet Bert who is delightful and pleasant, and doing a wonderful job with everything. Was NOT happy to have to leave but will definitely return as soon as I can!!!!! BEAUTIFUL UPGRADES TO THE WHOLE COMPLEX. ITS BEEN SEVEN OR EIGHT YEARS SENSE OUR LAST VISIT, TORCHES AND LANDSCAPING. Perfect location, perfect condo with all amenities. Excellent unit that has been renovated and updated recently. Our unit was lovely, right on the ocean. The outside maintenance was very good. We found the cleaning service to be remiss in cleaning under beds, furniture, etc. the management staff was very friendly and helpful..
Everything else is "second fiddle" to the view. We especially like the 2nd level because of the added privacy. This particular unit is nice but would suggest more cutlery and coffee mugs for when we have another couple staying for a week or two. Overall it was a very good 10 days. Perfect weather, great location with respect to the ocean as well as shops and park. We liked not needing to use the car; could walk to get groceries. The permanent residents of Makani Sands were friendly and welcoming. One drawback: our unit (207) lacked some simple basics -- broom, dustpan, kitchen scissors, small things like that. We could have/should have asked the office for those items. We stayed in the condo for 8 nights. It was well equipped with many extras. We especially enjoyed the use of the beach towels, beach chairs, books and binoculars. The view from the lanai was spectacular, and we enjoyed watching whales, dolphins, the resident turtles, sunsets and even a rainbow. It was within reasonable walking distance to groceries, fish store and coffee shop. Reservation and maintenance staff were friendly and knowledgable. We were pleased that we could arrange for a late check out on our final day for a reasonable fee. Although the condo did not have A/C, there was a nice breeze with the lanai and window vents open, so we didn't miss it. We discovered Kapalua Beach had good snorkel ing and was less than 10 minutes drive away. Lots to see and do in Maui and we enjoyed our stay.